But this was not the first time Avebury had fallen into grave danger. Around 596 AD the Roman Church issued a papal edict authorising Saint Augustine to operate a “destroy and rebuild ” policy concerning ancient British shrines. ‘Pagan’ temples which had stood since time immemorial were to be torn down and replaced by new churches consecrated to the new God, built on the ruins of the earlier site. Avebury only just survived these two events, Keiller’s determination restoring the henge site into the wonder we can all enjoy today. 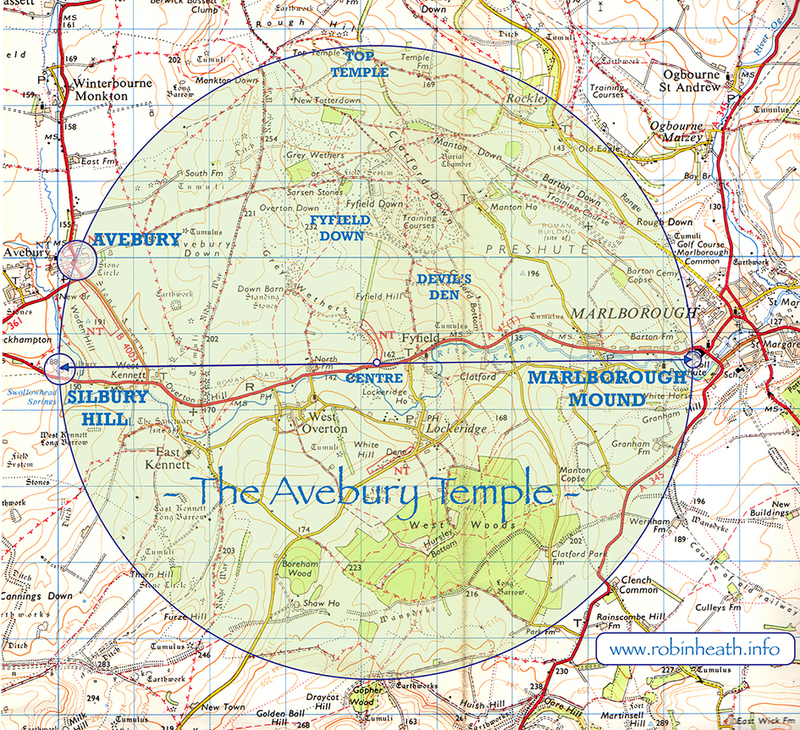 But what is that wonder all about, what exactly does Avebury do? Visitors regularly say that it sorts them out in some way, claiming a walk within the Avebury landscape helps them view life with a better perspective. So the questions to be asking are: What does this prehistoric landscape actually do to its visitors? How does this happen and why? For what purposes were three of the largest stone rings in the world erected at such vast expense of toil within such an unfeasibly large ditch and bank? These questions have not yet been satisfactorily answered, either by archaeology or by any other technique. We might have the dating sorted, we do know where the stones came from, what the people ate and how they dressed, but we know almost nothing about what was going on inside their Neolithic heads to inspire them to build Avebury, evidently once a must-have item. It is possible to search out highly relevant facts about Avebury, but many do not fit the current model of prehistoric life and are rejected as irrelevant by specialist historians and archaeologists. One consequence of this closed shop policy is that the conclusions from two meticulous surveys of all the existing stones at Avebury were totally rejected and ignored, with no reasons given. Undertaken over several months by a retired head of engineering at Oxford University, Professor Alexander Thom published the results of his survey in Megalithic Remains in Britain and Brittany (Oxford, 1978), concluding that the builders had employed a measure of 2.722 feet in laying out the radii of the various arcs in the largest stone ring. This important information has been gathering dust ever since because, in archaeological circles, it remains a heresy to mention either Thom, a brilliant academic engineer, or his ‘megalithic yard’. Yet to fully understand Avebury, Thom’s survey turns out to be essential, as we shall now discover. The word temple is a very overused and grandiose word when applied to megalithic and other ancient structures. How is it possible for so many commentators on as many documentaries refer to megalithic structures as temples without first having understood the specific and readily available rules that define how a temple should be designed and constructed? Temple: noun. An edifice in honour of a deity or for religious worship. Origin derives from older form: Temlum, a sacred enclosure, a piece of ground cut off and set apart for religious purposes. Affiliated to Template (Templet), a plan, pattern or model that holds to a component form of a temple. And while we are into semantics, it may be helpful to include Sacred: a consecrated space or monument that is rendered holy, an inviolate space, and Monument: a record, a memorial. Origin, Monere, to remind, cause to think. The Greek philosopher Plato wrote of universal or ‘nodal’ numbers that were part of some ancient sacred canon, by which the plan of creation might be understood by humankind. He suggested that a temple has to be designed according to this canon of measure. For the radius of a circular temple, Plato suggested that, ideally, and for apparently unknown reasons, why there should be 5040 of the chosen unit of length, making the diameter 10080 units and therefore the circumference of the temple 31680 units (Pi in this system is taken as 22/7). The unit of length or module is chosen appropriately for the intended size of the temple that is being created, the decimal point being arbitrarily positioned. By way of a significant comparison, at Stonehenge, the mean diameter of the sarsen lintel circle is 100.8 feet, and its circumference is therefore 316.8 feet, which fits the canon. Stonehenge employs perhaps the most ancient of units, the foot, and applying Plato’s rule, Stonehenge is correctly identified as a temple, often being described as being our ‘National Temple‘. 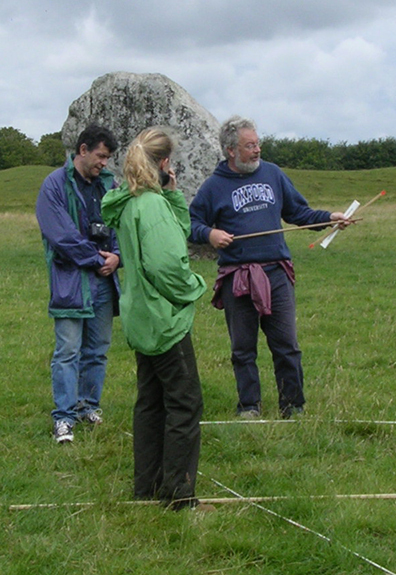 Returning to Avebury henge, Prof Alexander Thom’s later survey of the henge rings showed the metrological module that was used to be 2.722 feet. Applying this module – the Megalithic Yard – to a diameter that has to be 10080 units then ought to be 2.722ft multiplied by 10080, which is 27,438 feet. This, at nearly 5.2 miles, is ten times too big to fit inside Avebury henge, whose average diameter is only one fifth of a mile. However, if one looks beyond the henge out into the wider Avebury landscape, this valuable information reveals a previously lost and long forgotten Neolithic landscape temple. 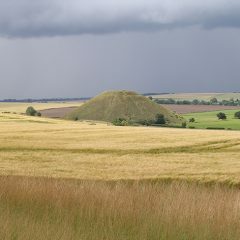 Silbury Hill is the largest earthen mound in Europe (below). It is over 100 feet in height, its flat top conspicuous over much the surrounding landscape. Far less publicized is a second, smaller earthen mound. 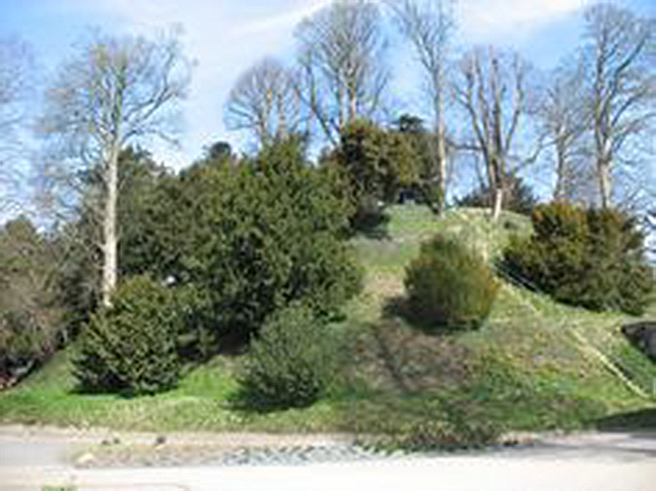 At two-thirds the height of Silbury, this ‘stepped’ mound is located in the grounds of Marlborough College. These mounds are both Neolithic, both conical, both have a flat top, and both have a slope angle of about 30 degrees. Silbury averages 520 feet in base diameter, Marlborough 278 feet (shown illustrated below). 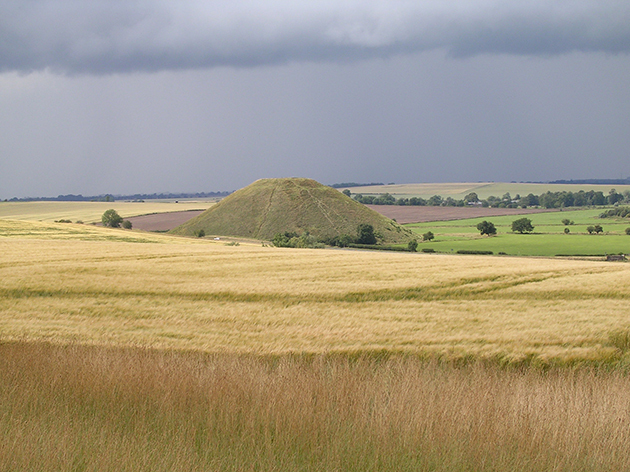 Marlborough mound lies almost exactly due east of Silbury Hill and their distance apart, centre to centre, is 27,438 feet, previously shown to be the product of 10080 and 2.722 feet. These two mounds therefore define the east-west axis diameter of a vast circle, whose circumference is 2.722 x 31,680, which is 86,233 feet. Combining Plato’s ‘temple numbers‘ with Thom’s megalithic yard of 2.722 feet thus defines the location and size of a circular landscape temple. (Above) Silbury and Marlborough are connected, they are related to each other. These two mound sites are shown above as a schematic side by side, with their relative dimensions. They are 27,438 feet apart, summit to summit, (east to west) and this is 10080 x 2.722 feet, which is 10080 Megalithic yards. Details of Silbury Hill and Marlborough Mound – where Plato unexpectedly meets Alexander Thom. Does Avebury henge fit anywhere within this bigger platonic template? Well, yes – the circumference of the temple circle cuts the henge through the geometric centre of the large stone ring, (whose perimeter measures 3545 feet) and passes through the 3:4:5 triangle ‘template’ whose corners, Thom discovered, defined all of the internally generated arc radii of that same huge ring. Two other centres are external to the ring, one off Green lane and the other on Waden Hill. Interestingly, almost all of Avebury’s buildings are also located outside of this ring, which cuts the centre of the henge precisely at the latitude 360/7 degrees. From the equator to Avebury centre is one seventh of the distance around the earth, 3554.7 miles. 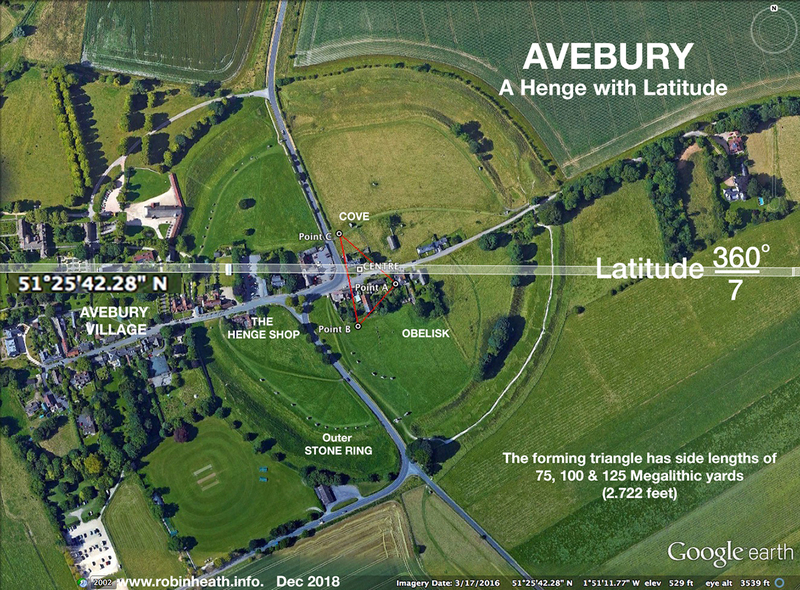 Figure Five – The strangeness of Avebury’s latitude. If the henge was deliberately intended sited at 360/7 degrees, it becomes a geodetic miracle from the Stone Age. We now superimpose onto the landscape that circle whose diameter is formed by the locations of Silbury and Marlborough mounds. In units of Thom’s Megalithic yards 2.722 feet (value obtained at Avebury from the extensive survey described in Megalithic Remains in Britain and Brittany, Thom & Thom, 1978), the diameter of this temple a la Plato, is 10080 MY, making its circumference, using 22/7 for the value of pi, as 31680 MY. For an interesting comparison, consider that just seventeen miles south, at Stonehenge, the mean diameter of the sarsen circle is 100.8 feet and the mean circumference is 316.8 feet. Let’s now look at points on the circumference through which it passes. The illustration below shows the circle drawn onto an OS map. The circumference, in addition to passing through the summits of both Silbury and Marlborough mounds, cuts directly through the centre of the large Avebury ring, Thus connecting both monuments. At its northern-most point the circumference of this newly revealed circular landscape temple passes through Top Temple and Temple Farm, which one might consider to be a further solid statement of its original role. That the same unit of length – the Megalithic yard of 2.722 feet – was employed in setting out the temple, as Alexander Thom discovered during his 1970s survey of the henge rings, provides a further confirmation of intent. The east-west orientation between Silbury Hill and Marlborough mound align it to the cardinal points of the compass, then provides a further rule within a temple tradition that has just been demonstrated as having originated two thousand years before Plato, during the Neolithic period. Discuss. There is yet more to admire here. Not only does metrology (the units of length) match to the design, it is also integrated with the geometry. But what a surprise to then find that both are also incorporated within the astronomy of this Temple, for the circumference length, at 86,233 feet, is seen to be the product of eight times the year length times the the month length (in days), and now something else quite magical has appeared, a further ‘wonderful thing‘. For now, feet become days, they represent lengths of time, a phrase still in regular use. This equation clearly recognises and incorporates knowledge of the an ancient calendar cycle of Sun, Moon and Venus where, after eight years or 99 months (lunations), these three celestial bodies repeat closely their positions in the sky, relative to the stars. The perimeter of the world’s largest stone circle, the outer ring at Avebury henge. once contained 99 stones, a further clue to its design purpose. To those who can recognise such things, this suggests that Avebury was a temple dedicated to the Sun, Moon and Venus. All of this may go some way towards explaining the cause of the beneficial effects many visitors feel when walking around the Avebury landscape, a form that brings down the sacred, by connecting sky with landscape, the ‘as above‘ to the ‘so below‘, all fully in accord with ancient temple building traditions. Visitors say they feel more connected after visiting the Avebury landscape, now here’s a reason for this, for Avebury has now been shown to indeed connect the sky with the landscape, the above to the below. I believe this to be the original Temple of Avebury, still identifiable and still on its original scared landscape, as it always has been since it was conceived, but which became lost to our culture such that no one could ‘see’ it in recent times. The original conception took place in the Neolithic, and we should now cherish its existence, for it is a masterpiece of its time, a product of a Megalithic Science that, until now, and like Avebury Henge, was so very nearly lost to us. Robin Heath with Students from Oxford University, at the Cove, Avebury. More on this on-going research work will follow shortly…. Copies of the biographical account of the life and work of Alexander Thom are available in an illustrated book, available from this website at £14.99. Visit the book section for details of how to order. Previous Previous post: The Henge Shop launch their new E-magazine!